Received September 9th, 2009; revised September 12th, 2009; accepted December 1st, 2009.
platforms by this new system, a practical and inexpensive improvement is achieved. 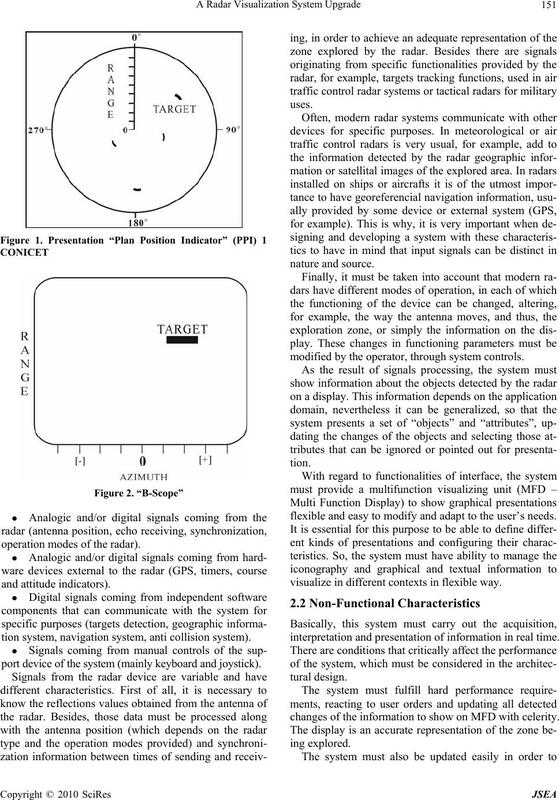 Air-to-Air radars, use presentations as “B-Scope” (Figure. whole replace of the equipment. 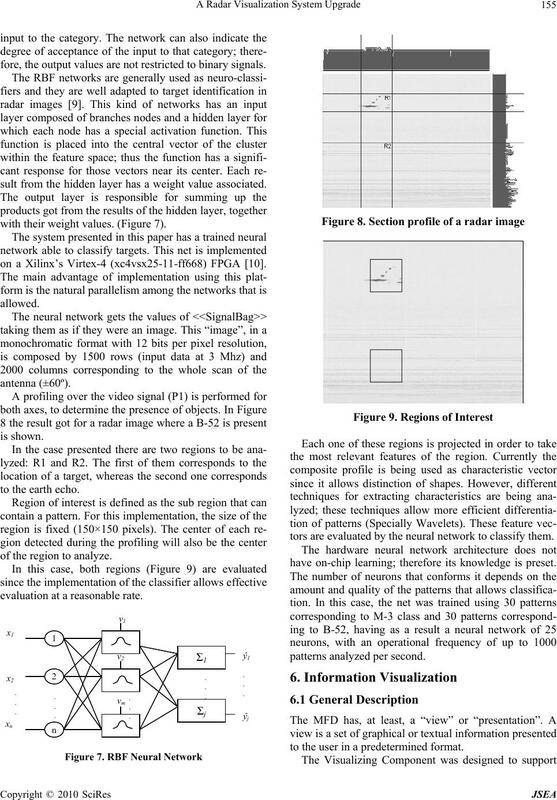 work of a radar signals visualization system is described. operation modes of the radar). tion system, navigation system, anti collision system). port device of the system (mainly keyboard and joystick). modified by the operator, through system controls. flexible and easy to modify and adapt to the user’s needs. visualize in different contexts in flexible way. interpretation and presentation of information in real time. changes of the information to show on MFD with celerity. formats, among other important functionalities. chronize the reception of signals. analysis on laser radar systems . tion radar, civil or military. chronization of processes to read information. tenna. The system produces 2000 pulses a second. Hz, with 180º for +60º and 0º for –60º antenna position. sity (noise) along the rest of the section. 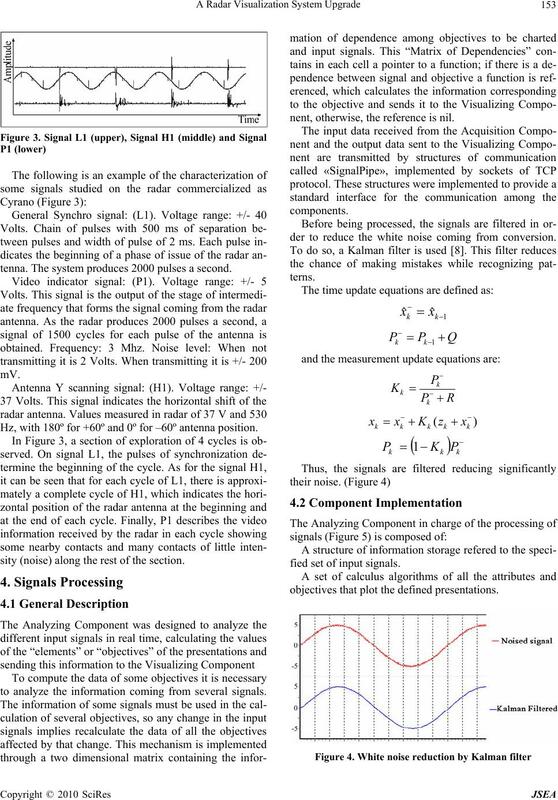 to analyze the information coming from several signals. nent, otherwise, the reference is nil. der to reduce the white noise coming from conversion. fied set of input signals. objectives that plot the defined presentations. 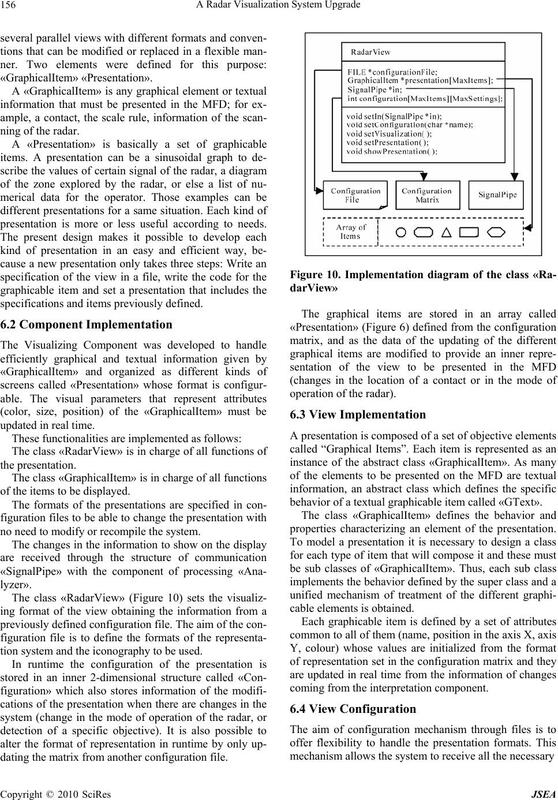 quisition Component and the Visualizing Component. data to calculate the visualization information. algorithms are run by the «calculate» method. sults to the output pipe «pipeOut». of the approaches to be used. fore, the output values are not restricted to binary signals. sult from the hidden layer has a weight value associated. with their weight values. (Figure 7). on a Xilinx’s Virtex-4 (xc4vsx25-11-ff668) FPGA . of the region to analyze. evaluation at a reasonable rate. tors are evaluated by the neural network to classify them. have on-chip learning; therefore its knowledge is preset. to the user in a predetermined format. presentation is more or less useful according to needs. specifications and items previously defined. of the items to be displayed. no need to modify or recompile the system. tion system and the iconography to be used. dating the matrix from another configuration file. behavior of a textual graphicable item called «GText». properties characterizing an element of the presentation. coming from the interpretation component. tion files with no need to recompile the code. tion and the values corresponding to its inner attributes. 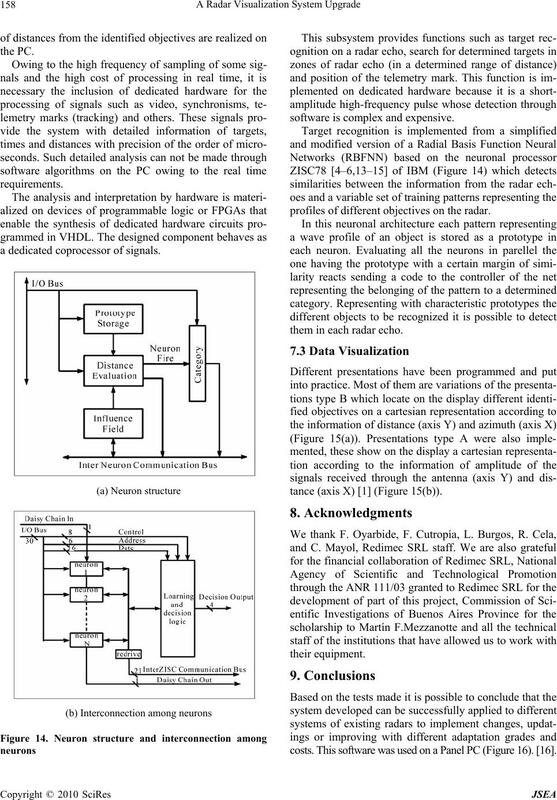 ing VHDL on Xilinx platform. 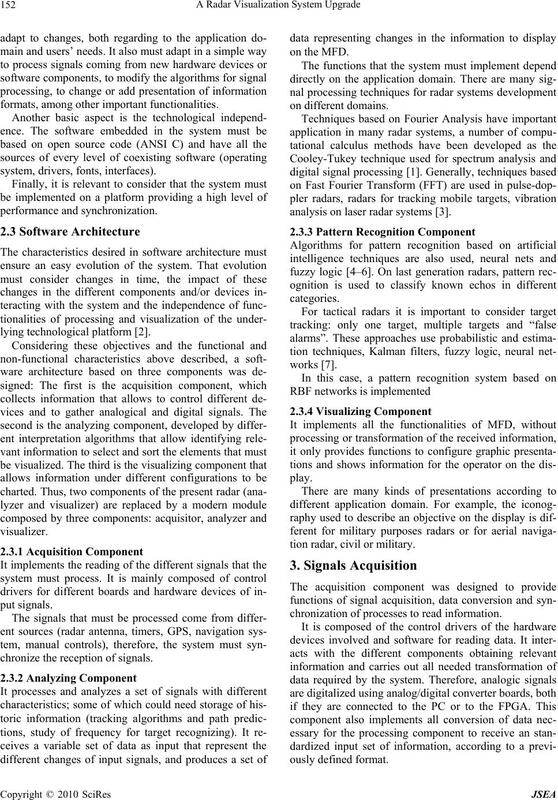 these functions on FPGA were developed. Computing, model PCI-DAS-4020/12 (Figure 12(a)). quency of up to 400 Khz. 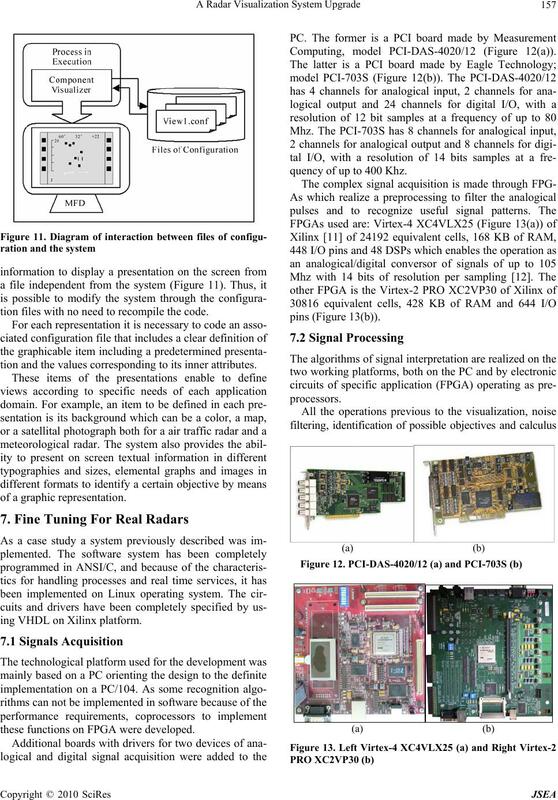 a dedicated coprocessor of signals. software is complex and expensive. profiles of different objectives on the radar. them in each radar echo. tance (axis X)  (Figure 15(b)). costs. 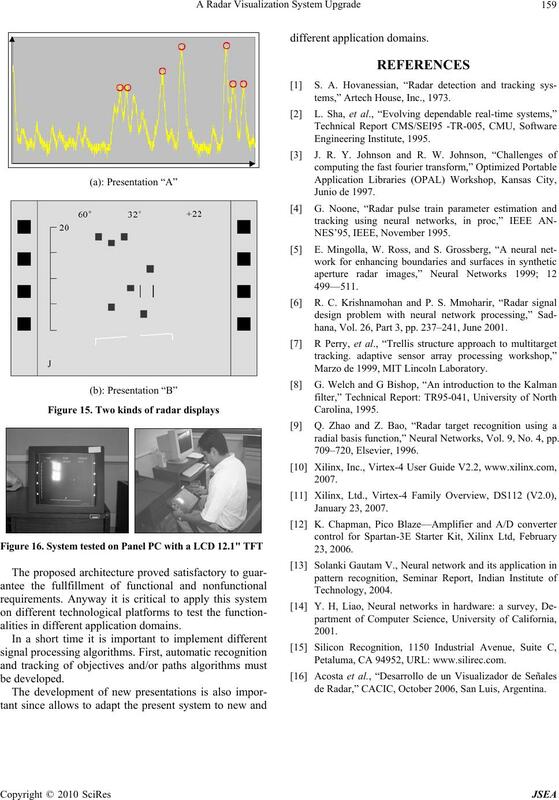 This software was used on a Panel PC (Figure 16). .
alities in different application domains. tems,” Artech House, Inc., 1973.
hana, Vol. 26, Part 3, pp. 237–241, June 2001. Marzo de 1999, MIT Lincoln Laboratory. 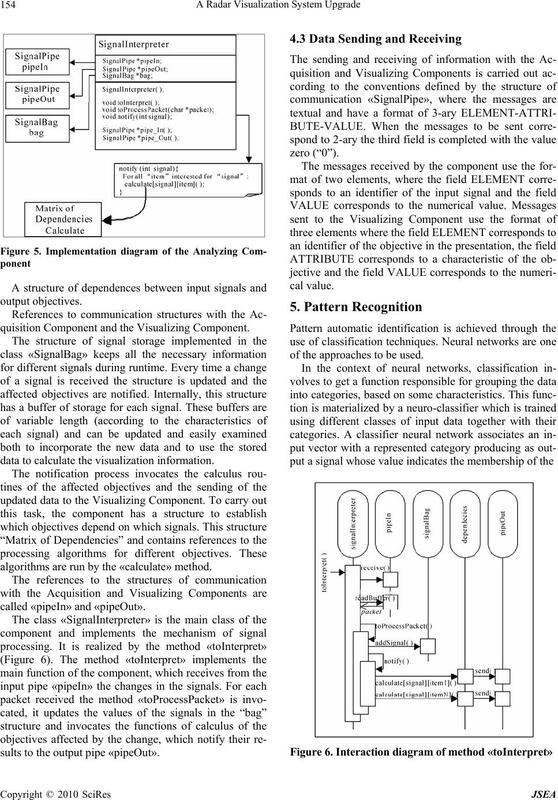 radial basis function,” Neural Networks, Vol. 9, No. 4, pp. Petaluma, CA 94952, URL: www.silirec.com. 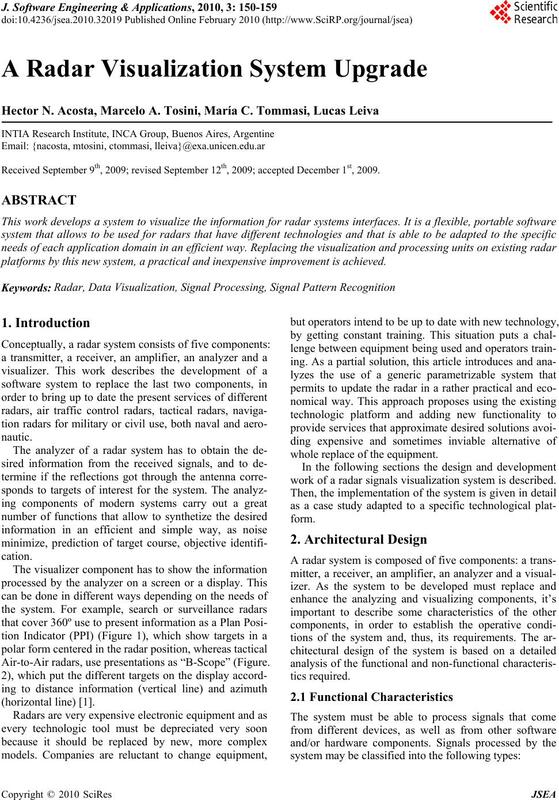 de Radar,” CACIC, October 2006, San Luis, Argentina.